Though we don’t have to worry about much snow in this part of the country, there’s still the possibility of ice storms and other nasty weather conditions looming. If you have a deck, now is the time to take care of maintenance and repairs. The last thing you want is for small problems to become a nightmare after months of drastic temperature changes, freezing conditions, and moisture. A proactive approach prolongs the life of your deck and reduces the likelihood of costly repair once the weather warms up again. 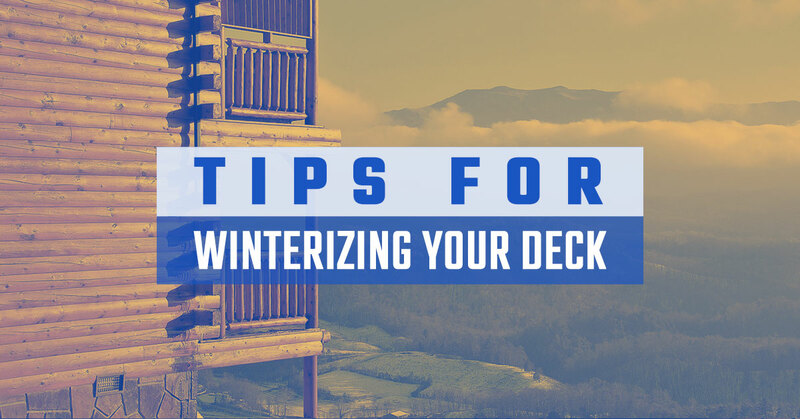 Keep reading for five tips on winterizing your deck. Remove dirt and debris – Those piles of leaves, pine needles, and branches may seem innocent right now. But once inclement weather makes its way through your area, they’ll trap moisture and promote rot. So get in the habit of sweeping your deck clean on a regular basis. It should only take a few minutes and is an easy way to keep your deck clear all winter long. Trim overhanging branches – You may love the shade created by large branches hanging over the deck. But if they aren’t stable, you could be setting your deck up for damage. Take the time to trim branches back before an ice storm causes them to snap and crash onto the deck and railings. Power wash – It’s always a good idea to regularly power wash your deck, but especially this time of year. Do you have an older wood deck and are concerned about damaging it? Try using a bleach-free cleaner that will fade stains without yellowing the deck. Watch out when washing around plants, though, as some run-off can be harmful. Add a sealant – Take a moment to think of the last time you stained your deck. If you can’t remember, then chances are you’re ready to do it again. A sealant that’s properly applied can make a world of difference. Store your deck furniture – Did you recently get some new deck furniture? Unless you’re not fond of it at all, it’s best to avoid leaving it out. If there’s room available, store the furniture in a garage, basement, or shed. You may not think so, but now is a great time to start thinking about a new deck! For nearly two decades, Ready Decks has been providing the highest quality, site-built decks in the shortest time possible. When you first get in touch with our deck contractor, the goal is simple: To provide the best porch or deck while keeping more money in your pocket. Quality – We only use the absolute best materials. As opposed to what other decking companies offer, the products at Ready Decks are constructed using premium-grade, treated lumber. Value – You won’t find more bang for your buck elsewhere. Thanks to our innovative, patent-pending building system, our decks look better and last longer. Affordable decks never looked so good! Integrity – Our deck installers stand behind the product. Best of all, each deck we build is backed by a lifetime limited warranty. Take the first step toward enjoying your own deck! Contact our local deck builders today.